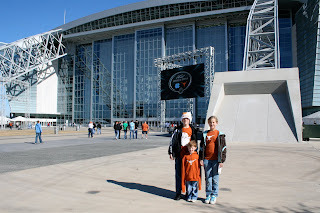 Just two weeks after the Big 12 championship game, we headed back to Cowboys Stadium to see another #2-ranked Longhorn team play, this time the men's basketball team. 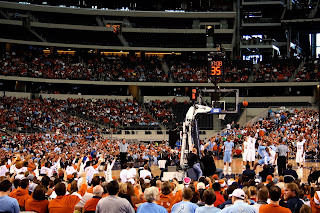 Featuring the Horns and the defending national champion North Carolina Tar Heels, this was the first basketball game ever played at the new stadium. 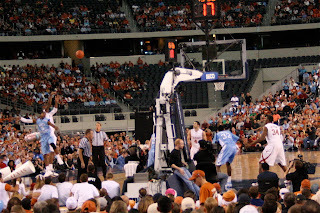 Our seats were behind the goal and not far from the band and Texas bench. 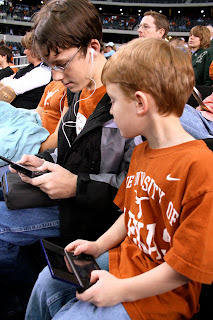 The boys kept themselves entertained before tip-off! Gotta love the DS! 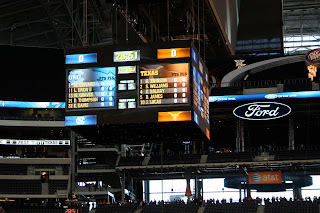 For basketball the stadium has a special scoreboard that hangs below the ginormous "Diamond Vision" screens. 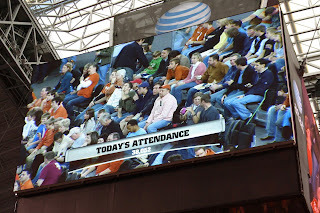 This was a home game for the Horns: Texas announcers, the Longhorn Band and our UT promo. 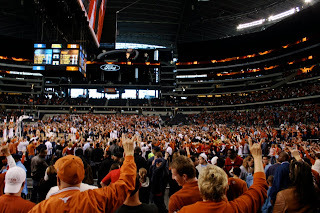 "Get your Horns up!" 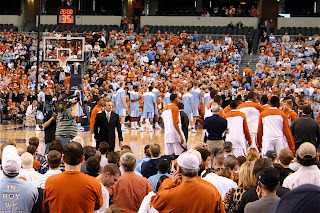 It's been almost two years since I've seen the Horns play hoops, so it was nifty to see Coach Barnes and the guys up close. Tip-off! 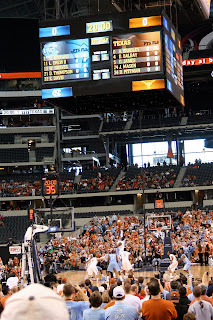 The game was really close for most of the first half. Our lunch break gave us a chance to ride in a private elevator (to get from the floor to the concessions) and see the game from the party pass area. AND Katie got to make up a new song: "Seven! Seven dollar! Seven dollar footlong!" But what a view from that end! 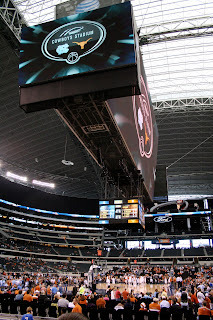 Our seats were in the taller risers behind the goal. 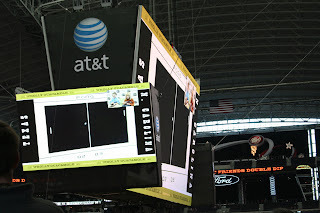 During one timeout, the stadium announcer made a big deal of using the giant screens for an extra-large video game. The game of choice? Pong! 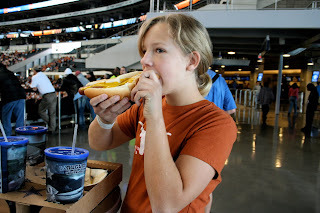 In the second half, the Horns were shooting on our end. 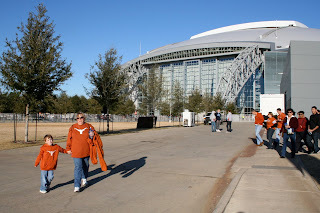 At Texas-ou we have our "lucky endzone." 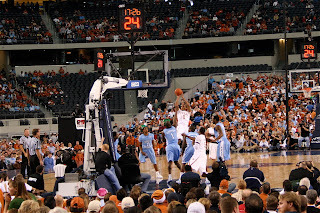 Well, this must be the lucky goal because the Horns pulled away from the Tar Heels in the second half. The Horns were hitting from everywhere! It helps to have a deep bench. 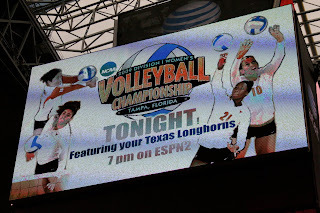 Later that night our volleyball team played for the national championship. They lost, but what a season those girls had! 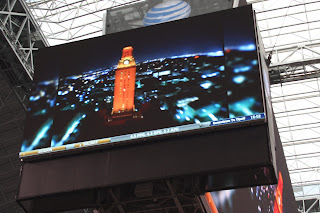 And what a great time to be a Longhorn: #2 in football, men's basketball, volleyball AND the preseason #1 in baseball! LOVE IT! 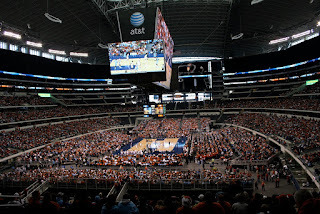 More than 38,000 were there for this game, which the stadium folks said was a trial run for the NBA All-Star game that will be there in February. 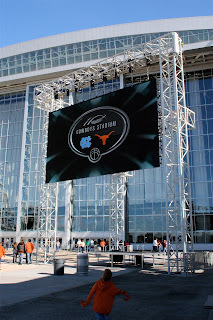 Of course, most of the 38,000+ were Texas fans, but UNC was well-represented, too! 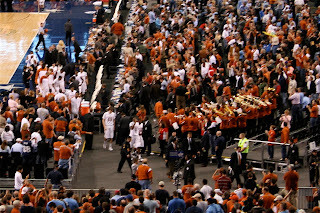 Horns win, 103-90! Then it was time for "The Eyes." 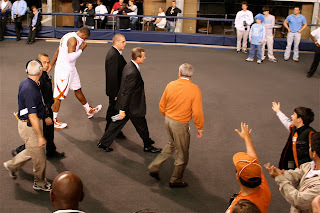 After the game we moved to the end of our section to watch the players head to the locker room. 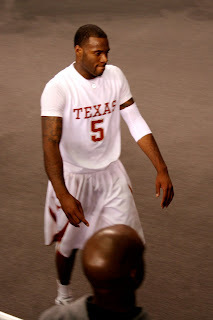 Damion James and the others are BIG BOYS! 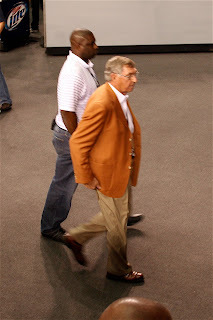 We got to see Dexter Pittman and Coach Barnes go by, too. And then there's Deloss Dodds, UT's men's athletic director. Don't you know he's riding high these days? 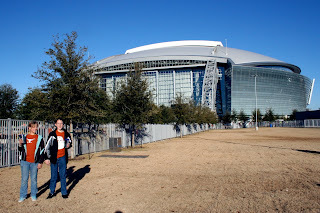 It was a fun afternoon at the stadium, considerably less stressful than the last time we were there! 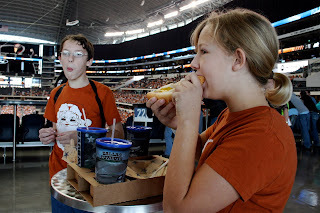 It was great to get to take the kids, too.